Oh, and praying before, during, and after. Those who know me well know I channel Claire Huxtable in my best mothering moments. There are other, real people in my life that set the example for the kind of Christian, women, and friend I seek to be. Each of us, I am sure, has people we emulate, for any one of a number of reasons. While that’s generally a good thing within reason, we’ve always had a reliable map available. Proverbs teaches us many things, not the least of which is, while we think we may be very smart, and we thank God for his Providence, we should not rely upon our own grey matter. “Trust in the LORD with all thine heart; and lean not unto thine own understanding.” Yeah, you’re (we’re) smart and all, but it’s so much better if we’re not driving the bus. Here’s the best part, with only an acknowledgement of God and His Divine Grace, He’ll drive the bus! I see a very practical application for me as I seek to follow the map. Have you ever noticed that acknowledging someone or something requires energy and focus? Merriam.com defines “acknowledge” as “taking notice of.” If you paused to take notice before speaking and acting, regularly, would you likely be more or less proud of the things you said and did? I’m choosing mindfulness in acknowledging Him. For me, that means thinking before I act, considering before I speak, measuring my words and my actions prospectively. Oh, and praying before, during, and after. Prospectively. You see, I am a remarkable Monday morning quarterback. I sometimes get it right on time, in real time, but I need better stats. I’m no longer accepting close, but not close enough. I’m following the map. Yolanda Adams, singing “Open My heart” gives me the self-talk I’m intending to master. I’ve got the map. I’ve even got a soundtrack for the road. I’m doing better; hittin’ the target more regularly, because by pausing to measure, acknowledging the proper model, perfection may still be a moving target, but I’m always, with a map, going to be moving in the right direction. I will still miss. I’m human. But with the map, I’ve never shooting entirely in the wrong direction anymore, and that’s an abundant blessing. So, for all those who were wondering, having a map is a good thing. 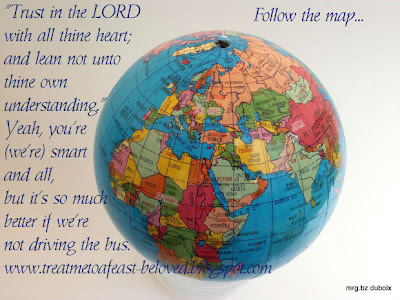 It is certainly more evidence that the map maker, God, is good.